Shiraz by Coriole of McLaren Vale. The palate is medium to full bodied with red fruits, dark berry and cigar box, blackberries and plum. Coriole is one of McLaren Vale's most eminent, artisanal estates. Winemaking at Coriole is very traditional and always labour intensive, vinification is carried out in open fermenters, while treated to hand plunging and pumpovers. A structural wine that's rich and creamy, oak is well integrated, the finish is long with ripe and fine grained, chocolate tannins. The paths of Coriole and Seaview crossed in 1935, when the Kays bought Hope Farm. The Mannings had sold Hope Farm to the Cravens in 1891, and during World War I, the Craven's son was killed in action. In his grief, his father lost his mind, and the property was managed by his wife until 1935. In that year, she sold it to the Kays of Coriole, who ran both properties until 1948, when they sold to Edward Chaffey, and it became known as Seaview. In 1962, Coriole was sold to John Snell,who was of Swiss descent. Snell established Australia's first organic winery, Chateau Ban Sante. He farmed the original shiraz vines without chemical inputs, and built a small winery, which remains the nucleus of Coriole's modern winery today. Hugh and Molly Lloyd acquired the property in 1968 and the first vintage release under the Coriole label was 1970. Hugh Lloyd (1914 - 1994) was a general practitioner in Adelaide's southern suburbs. The son of a Methodist minister, he had been raised in a teetotal Adelaide family, but had become very interested in wine in the 1950s. Molly Lloyd (nee Parsons 1914 - 1994) also had an enthusiasm for farming, as a member of the Parsons family who grew almonds and grapes and other fruit on the rich horticultural lands along the Sturt River in what is now suburban Oaklands Park in Adelaide. Together, Hugh and Molly laid strong foundations for Coriole. Hugh Lloyd embarked on a development plan for the winery and vineyard, using the old shiraz vines to establish the reputation of the business, while equipping the winery with more modern technology. He was helped in the early years by winemaker Graeme Stevens, with Coriole winning the coveted Wine Bushing King and Queen title in both 1974 and 1975 for making the best shiraz wines in the McLaren Vale district. The 1980's were a relative quite time in the Australian wine industry. It was during this period that Coriole pioneered the development of Italian varieties by planting Sangiovese, which became the only Sangiovese produced in the country for many years. 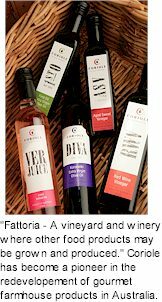 Also during this period Coriole was one of the first companies to release an extra virgin olive oil and start producing aged sweet vinegar - released each year after five years maturation. As the 1990s developed, interest in wine boomed. This was reinforced by the increasing evidence of the health benefits of red wine. During the 1990's the winery expanded its markets both in Australia and overseas. Winemakers at Coriole have included Robert Paul, Stephen Hall and since 1999 Grant Harrison. Paul Lloyd,the youngest sibling of the Lloyd family, became business manager in 1993. Today, Coriole employs eleven full time staff, and crushes more than 500 tonnes a year. The winemaking at Coriole is preceded by thorough assessment of wine styles and the wine plans for each vintage. This process involves many members of staff, including managing director Mark Lloyd. The aim is to maintain Coriole’s tradition of producing premium full-bodied red wines from McLaren Vale, focusing on Shiraz and Cabernet Sauvignon. However, we are also enthusiastic about the ambitious plans for Sangiovese at the winery and its potential to produce such a contrasting style to Shiraz. Coriole carries its tendency for innovation and experimentation into winemaking as well. Often this involves the evaluation of different vineyards. However, each vintage is an opportunity to experiment with new techniques and evaluate their role in achieving the Coriole wine style. Most commonly very traditional techniques are used. Red wines are mainly open fermented in stainless steel or old wax lined concrete tanks. Ferments are hand plunged 2 and 3 times a day with warm but controlled ferments. New oak is used in some red wines but usually only after prior experimental use has established the appropriate role of the oak. Many wines are such as Sangiovese and Redstone are specifically matured in older oak to gain maturity but with mimimum contribution of oak extract in the wine. The ageing potential of these wines is not compromised in any way.